Unless you’re among the most committed of outdoor enthusiasts and have a lot of time on your hands, seeing all of Zion National Park in a single vacation is a daunting endeavor. If you’ve only got a weekend, you might want to restrict your explorations to the heart of the park—Zion Canyon itself. The Zion Canyon Scenic Drive is a paved road that runs along the bottom of the canyon all the way from Springdale to the Temple of Sinawava, allowing you easy access to all the sights and locations along its length. In fact, if you prefer driving among breathtaking scenery to hiking in the great outdoors, you can see the whole thing from your car—stick your head out the window to see the canyon walls towering up to 2,000 feet above you. Another great option for the speedy sightseer is the Zion shuttle bus, which runs every ten minutes and stops at all the major points of interest in the canyon along the way. If you like camping, there’s two sites to choose from: Watchman Campground, which takes reservations, and the South Campground (ironically situated just north of it) which does not. Between them is the famously-green Zion Canyon Visitor Center building, with a ranger station and nearby picnicking area. Stop by the ranger station to get permits for overnight hikes, back-country camping or entry to the hazardous slot canyons. Three popular trails have entrypoints near the camping areas. The Watchman trail gives you a good 2-hour hike ending in a great view of the Towers of the Virgin, a series of ridges that glow in brilliant colors at sunrise and sunset. The paved Pa’rus Trail, which runs parallel to the river, is the one trail in the park where dogs and bicycles are allowed. The shorter Archaeology trail ascends to the remains of prehistoric buildings near the canyon, and features educational displays at key points. If you’re into archaeology, another place to check out is the Zion Human History Museum, which catalogs the entire known history of the area, spanning from the earliest Native American settlements to the development of the National Park. Further north the road forks, branching off into the Zion-Mount Carmel Highway, which leads to the eastern side of the park. Past the Patriarchs you’ll find Zion Lodge, the refuge of those who want to stay in the park but don’t like roughing it. The Lodge offers private cabins, hotel rooms and full suites to its guests, as well as great dining options. You can have a hearty meal at the rustic Red Rock Grill, or enjoy a light lunch and a locally-brewed beer just outside at the Castle Dome Café. Just outside Zion Lodge is the entry to Sand Bench Trail, a popular route for guided horseback rides. Also nearby is The Grotto, a picnic area and rest stop that serves as a point of entry to several of the more strenuous trails. Near the north end of the canyon proper is the trail to Weeping Rock, a series of dripping springs and almost-waterfalls that issues from a “spring line” between strata in the cliff face, with naturally-occurring hanging gardens beneath them. 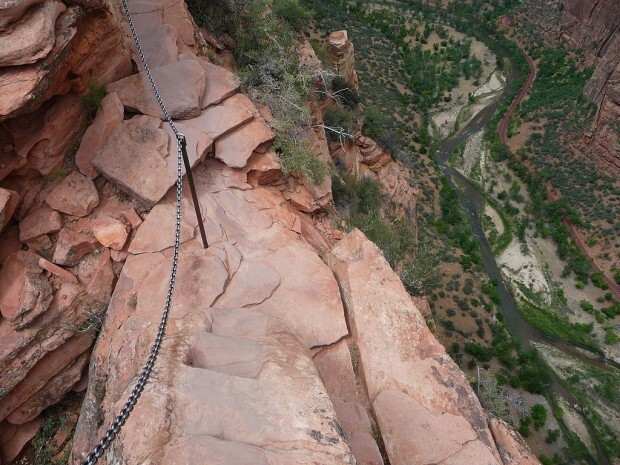 If you like your beautiful views a little more inaccessible, try the nearby Hidden Canyon Trail or East Rim Trail. Neither one is for the faint of heart, with long drops and frequently-icy paths, but the vantage point found at the end is well worth the trek. East Rim’s Observation Point offers a view of the entire canyon spread out beneath you. And then there’s the Temple of Sinawava, where the canyon walls begin to constrict. The road ends in a loop here, but the gentle Riverside Walk continues onward for a mile, serving as an excellent conclusion to the canyon. A conclusion, that is, unless you’re feeling especially adventurous—in which case, you can continue past the end of the trail into The Narrows.